I am a relatively self-aware person. In the organization I work for, development and growth are highly valued and frequently discussed. Growth and development BEGIN with self awareness. I know who I am. So, imagine my surprise when I went to the store and bought a Christmas wreath for our front door in early November!! Me! The one who does not get excited about Christmas things. And then I heard someone playing Christmas music a couple days after that (still early November mind you) and did NOT HATE IT!!! What the heck is happening to me?! If you know me, you would be shocked. Delighted, perhaps, but most definitely surprised by this new attitude towards all things Christmas. Actually, I became most concerned when, just today, I was looking closely at a picture of a cat and thought “I really want that cat.” A CAT?! Since when have I ever wanted a cat?!?! NEVER. Never. Never. So strange, because it was so sincere inside me. My dreams are often very vivid, a little odd, and can be very revealing about what is going on in my head…or not. There was the dream about designing a new Mace with regenerative cells so the burning effect wouldn’t wear off. Or the one where I had to coach a basketball team. Or the one where I was walking around carrying a big wad of cash. My dreams are not dull. Twice this month I’ve dreamt that I discovered hidden, forgotten rooms in a house we lived in. What does that mean?! Am I the house? Are there hidden and undiscovered things in me? I am taking on lots of new responsibilities at work and learning new things so that is probably where that comes from. ?? But the cat? And Christmas? I don’t know what that is all about. Somebody tell me what’s happening to me! It starts with a nagging thought. A worry. A what if. It can be something really BIG or something very small. I can go so quickly into a downward thought spiral…a hint of worry leads to sea of raging anxiety! Oh my, sometimes I can’t even sleep, or even breathe, I get so worked up. But God says it’s as simple as presenting our requests to him, and letting HIM bring the peace. Phil 4:7 And the peace of God, which transcends all understanding, will guard your hearts and your minds in Christ Jesus. The sweet peace of God is what you get when you bring everything to God (as stated just before in v.6). Oh, how often do I need the peace of God to guard my heart and mind??!! Too often. Much too often. Which brings me back to my previous post…PRAY!! And here’s something else new for February! Look familiar? A month ago, I posted a pic of the word that is my focus for 2013. Grace. I wrote it down, stared at it…and wanted to make it a permanent part of my life–a part of who I am and what I’m known for. So I had it scratched into my skin with ink. It hurt a little, but I’m really happy with it, and it’s original, it’s mine, no one else has anything just like it. It’s permanent. I’ve always been a conservative person—not to the extreme like I’ve seen on some reality tv, but conservative–believing strongly in right and wrong and absolute truth. This conservative nature can lead to a judgmental attitude. I don’t want to be known for that attitude. I want to be known as someone who loves and accepts people exactly where they are. Perfectly legit concept, right? So why a tattoo? It’s a lil bit of irony I suppose. There was a specific time that I did not show grace to someone really important to me. So, its sort of my way of making amends. Admitting I was wrong. When my firstborn was 18 (just last year), he decided to get a tattoo. Actually, he probably decided before he turned 18, but couldn’t get it ’til then and until he moved out of the house. He went big and a little eccentric–a phrase written in elvish across his chest. Elvish–like from Lord of the Rings. I would be lying if I said I loved it or even agreed it was the right move at his age…but that’s not the point. I know he felt judged, he felt my disapproval. He is such a great kid and I know that he cares and, like most kids, strongly desires the approval and acceptance of his parents. What he got instead, was disappointment and disapproval…judgment. I was wrong. 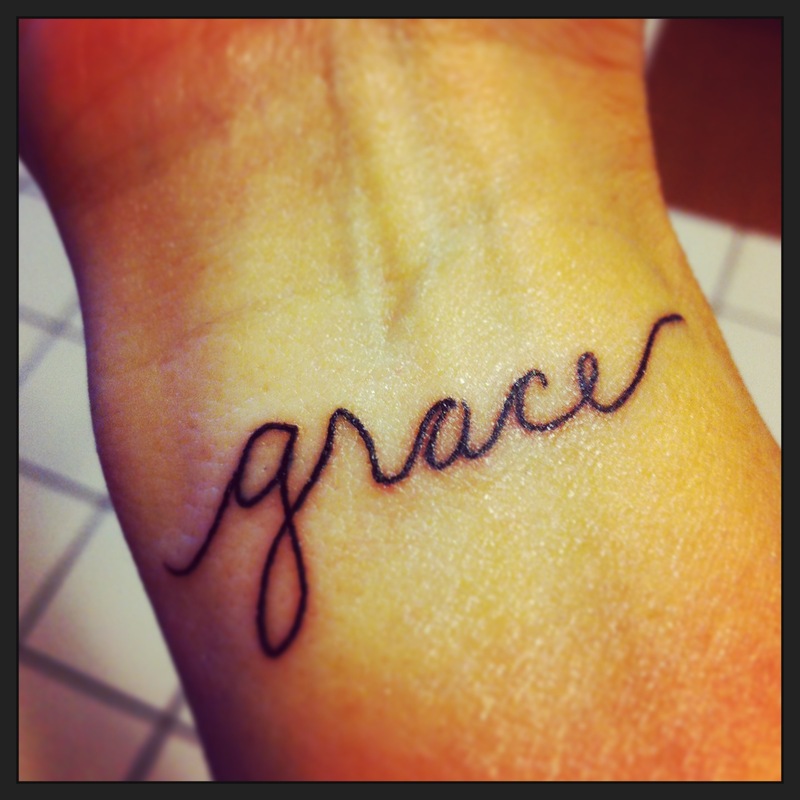 So….GRACE. Believe the best in others. Accept and love without question. Do not place your beliefs and expectations onto someone else to see if they “measure up”. The year 2012 in the life of CariKelley was the same as most…with its ups and its downs. Here are some highlights and lowlights and firsts in no particular order of importance or occurrence. Learned how to drink my coffee black–while this is not exactly a great feat in the grand scheme of things, it is notable in my life. and to say that I “learned” is really not accurate–more like forced. Since I decided to “clean up” my food intake and because the creamers that I like and were using did not meet the minimum standards for health, they are out. Coffee, however, is necessary, so henceforth and hereafter, it is black. Lost that last 10 pounds–finally. My weight loss/fitness progress had plateaued for about a year. No matter what I did, I couldn’t seem to make any forward progress. In November I heard about the Whole30 and decided to give it a whirl (mostly to deal with a nagging neck pain that remains unresolved). 30 days of no sugar, no dairy, no legumes, and no grains (NONE!) and that did it. Wow…it wasn’t easy but it was life changing. Found out I live in a money pit…my house is broken. Foundation, plumbing, and other random crap. Approximately $25G’s to fix it to make it sellable. So…I guess we’re stuck here for a little while longer….or a lot while longer. I can think of 3, maybe 4, solutions to this “problem”–1. a $$ windfall, 2. a destructive house fire (not wishing for this, but if it were to happen…), 3. Jesus comes back, or 4. we borrow money to fix everything and then slowly, gradually pay it back over the next 10 years. Only options 1 and 3 sound attractive at the moment. My oldest child left home at 18–with some time I’ve come to realize this really is a good thing…no matter how painful it is, it’s good for him and good for us. Wow…really hard though. But he needs to grow up and what better way than the “sink or swim” method? I know he has a strong faith foundation and I believe in him. I hate to see him go through rough times, but he’ll be stronger and wiser in the end. my reputation!” Need I say more? I’ve already got a list of firsts I’m going to do in 2013. Take a Zumba class. Take a Yoga class. Try a different alcoholic drink other than a Frozen Margarita. Get a tattoo (this one is another massive shift in attitudes and beliefs I should talk more about later). Maybe I’ll do one brand new thing a month–wouldn’t that be something to type about!? Oh, how I hope you sung the title to this blog post to the tune of Marvin Gaye’s epic hit from the 70’s!! So much going on in my life right now. Fasting, new experiences, planning a new year, etc. God is using experiences (some painful) to teach me about judging, accepting, loving…you know, some basic do’s and don’t’s of how to be a person. As soon as things solidify in my mind, I’ll dedicate a post about it. It’s all still forming. Verses I’m meditating on– Mark 7:8-9, Gal 5:14, Col 2:22, 23 in case you want to try to anticipate me. I’m a week into my 2nd Whole30 (or maybe more like a Whole21). I do a 21 day fast at the beginning of every year with staff at the church where I work. I decided to fast sugar, legumes, grains, and dairy…essentially the Whole30. Of course, the emphasis this time will be on the spiritual, not the physical. It’s been MUCH easier this time–partially because I’m surrounded by people that are also fasting and partially because my body is functioning much better and I’ve kicked the sugar and bread addiction. No weird dreams or detox symptoms like before. In other big news, my family is hosting 2 exchange students from Korea this month! This is a first for us! They are here as part of a language program with other kids from their school, we have two 15 year old girls who are very sweet. They’ve only been here for 2 full days and nights so we still really aren’t past the awkward stage and they haven’t quite gotten past the jet lag. Today I taught them how to pour cereal out of a box. It’s gonna be an interesting month. haha!